In the fall of 2009, Dorothy Byrd was so sick, so delirious, and so unaware of her surroundings, her desperate family was losing hope. Today, things are very different for this lively and expressive 80-year-old Fairfield resident. Not only is she now up and out of bed, but she is walking, has rejoined her various club activities and is even driving again. “I don’t remember anything and that is out of character for me. 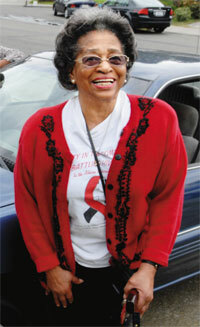 I became discouraged and thought I might just go join my husband, who passed away four years ago,” Dorothy says. The infection and other complications had worsened her condition, and she was readmitted to the Vallejo hospital where her surgery had been performed. For several weeks, Dorothy would be treated there and then released to the Fairfield rehabilitation center, only to be rushed back to Vallejo when another complication arose. “After six weeks of going back and forth,” Charlene says, “I asked her doctor, why can’t we just go around the corner (to NorthBay)?” That’s when Dorothy came under the care of Hospitalist Andrea Ngo, M.D., and Terrell VanAken, M.D., medical director for NorthBay Bridges, a palliative care program designed for patients who have chronic and difficult-to-manage health issues. “A lot of whatwe do is to communicate—between the patient, the medical staff, the family and care facilities,” Dr. VanAken explains. 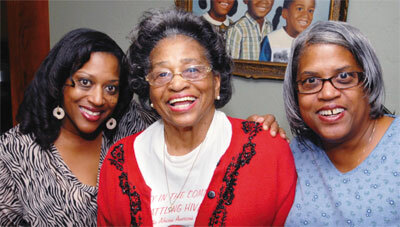 Dorothy with her daughters, Elizabeth Byrd (left), and Charlene Rushing. Palliative care uses an interdisciplinary team approach—with a clinical social worker, program administrator, chaplain and medical director—to work with the patient’s physician to provide treatment that not only addresses pain and symptom relief, but also addresses any emotional, social, cultural and spiritual needs these patients and their families may have.